Podcasts are like your own Internet radio or TV show, with music (from iTunes or elsewhere), pictures, sound effects, video, or some combination of these. Fans can find your podcasts on the Net (or in iTunes) and subscribe to receive them regularly. Just remember that podcasting was introduced with GarageBand 3, so don’t try these steps with an earlier version of the program. 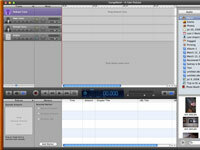 1From the opening GarageBand screen, click New Podcast Episode and type a name for your podcast. The main screen is a little different from the GarageBand screen for music. At the top of the tracks list is a special Podcast Track to drag photos or other artwork from your iPhoto Library (or elsewhere), accessible through the GarageBand media browser. Next are tracks to optimize for a male or female voice, plus Jingles. 2If you haven’t already done so, plug in your microphone, choose an audio track (Male or Female), click the red record button, and start talking. You can choose a male or female voice. Don’t worry too much about what you say; you can apply editing tweaks later. 3To add a radio-style jingle to your podcast, open the loop browser (by clicking the button that looks like an eye), select Jingles, and then drag the appropriate jingle onto the timeline. More than a hundred jingles are included. You can click one to hear a sample. 4To add extra audio effects, in the loop browser, choose Sound Effects or Stingers and drag it onto the timeline. Sound Effects include sounds ranging from an airplane landing to an alarm clock bell, while Stingers encompasses things like cartoon chipmunks to comedy horns. 5To add artwork to your podcast, drag pictures from the Media browser onto the podcast track. 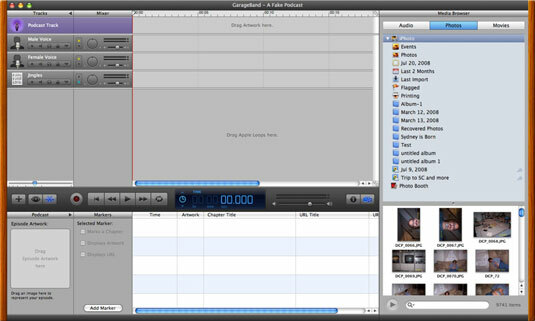 A chapter marker is added for each picture in a window near the bottom center of GarageBand.